Detail of a Philippine barong (20th Century) showing alternating bands of contrasting patination indicating that the blade was built up from multiple rods. Though not clearly visible in the photograph, slight weld boundary imperfections may be seen upon close examination of the blade. The wide blade of this Philippine barong shows several bands of contrasting patination which converge at the tip and towards the hilt where the blade narrows. Such piled structures most likely naturally evolved from the need of smiths to join together multiple pieces of steel to form a larger fabrication such as a blade. The piled structure also has the potential to bring significant advantages in durability and localization of desired characteristics (hardness at the edge and fracture resistance at the back and center). 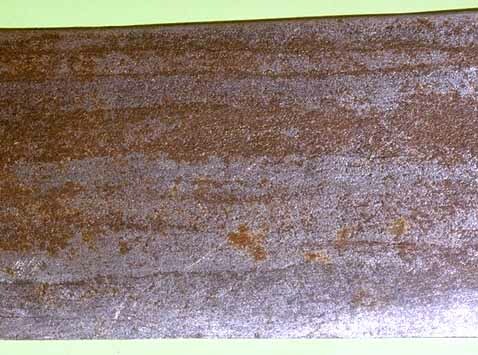 Detail of a Naga (India) sword-dao blade showing longitudinal banding corresponding to a blade composed of several rods forged together. Similar evidence of piled construction may be seen in Tibetan swords and in the sword-daos of the adjoining Naga culture, which are regarded as having been imported from Tibet or made from imported Tibetan iron rods in Tibetan style (See Rawson (1968), p.63 - 64 and Figs. 37 & 38). Twisted rod forms characteristic of pattern-welding may also be seen in Tibetan swords. Detail of a European Celtic long sword blade (1st Century B.C.) showing similar longitudinal banding and a longitudinal break between two bands in an area where the sword had previously been bent and later straightened. Pleiner (1993) documents such piled blade structures in Celtic swords from as early as 500 B.C. In Europe, such piled structures continued through the 11th Century and metallurgical analysis of an ULFBERHT blade has shown such a structure (Williams (1977)). Improved raw materials became available to swordsmiths in later medieval times in Europe with subsequent swords tending to be of altogether homogeneous material or to have a homogeneous core with edges of harder (higher carbon content) material welded on.